Passed by the House of Representatives at the start of the 1836 session, the gag rule rejected all petitions against slavery, effectively forbidding Congress from addressing the antislavery issue until it was rescinded in late 1844. In the Senate, a similar rule lasted until 1850. 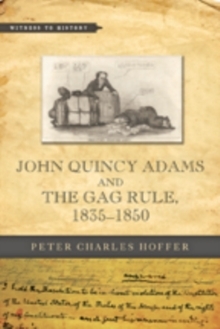 Strongly supported by all southern and some northern Democratic congressmen, the gag rule became a proxy defense of slavery's morality and economic value in the face of growing pro-abolition sentiment. 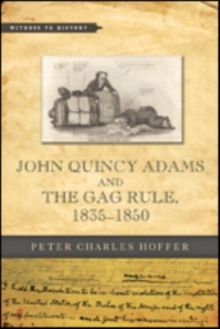 In John Quincy Adams and the Gag Rule, 1835-1850, Peter Charles Hoffer transports readers to Washington, DC, in the period before the Civil War to contextualize the heated debates surrounding the rule. 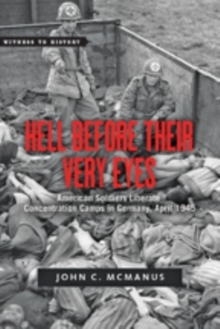 At first, Hoffer explains, only a few members of Congress objected to the rule. These antislavery representatives argued strongly for the reception and reading of incoming abolitionist petitions. When they encountered an almost uniformly hostile audience, however, John Quincy Adams took a different tack. He saw the effort to gag the petitioners as a violation of their constitutional rights. 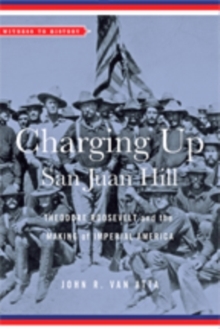 Adams's campaign to lift the gag rule, joined each year by more and more northern members of Congress, revealed how the slavery issue promoted a virulent sectionalism and ultimately played a part in southern secession and the Civil War. 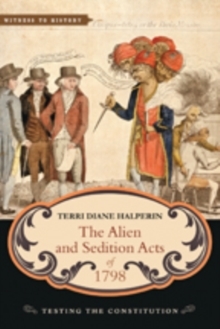 A lively narrative intended for history classrooms and anyone interested in abolitionism, slavery, Congress, and the coming of the Civil War, John Quincy Adams and the Gag Rule, 1835-1850, vividly portrays the importance of the political machinations and debates that colored the age.